Last year I had several enquires about lessons… mostly from the same lovely lady. She dearly wanted to make her children a glorious, hand-crafted cake, but needed some guidance. Her persistance was just the motivation I needed to finally teach my first lesson! 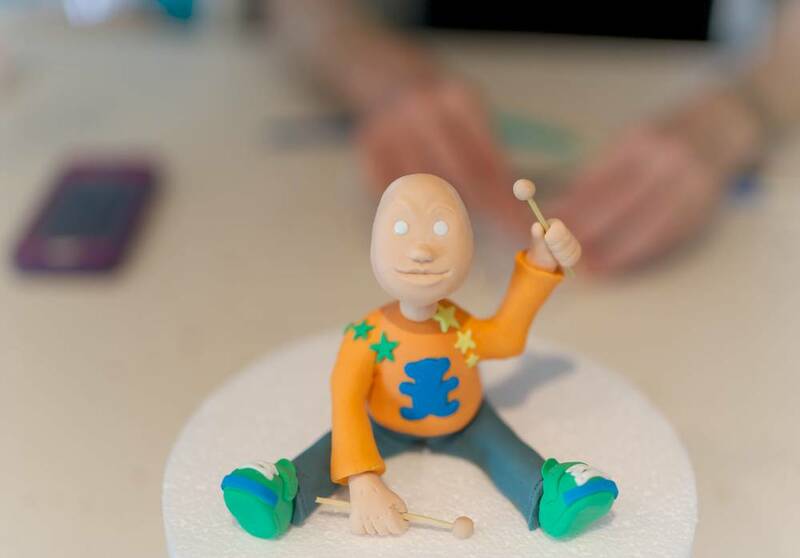 We found a space between my cake bookings and scheduled in 101 Fondant Figurine Making, followed by 101 Decorating A Fondant Covered Cake – Drum Design. Her little boy was turning one year old and he LOVES drumming so she chose to make a drum design based on his favourite toy. Meet Daria: an inteligent, funny, life-loving mummy of two beautiful children, and a creative soul. She arrived with a huge smile and a hug for me. She was so happy to finally be doing something she had always wanted to do. This was her time. As a mum myself, I completely understand how important this is. After a consultation about her cake creation and sketching up the cake plan, we got to work creating the fondant figurine of her son, Claudio, to sit on top. Daria learning how to sculpt with fondant. Daria was a complete natural! With a few pointers from me, and using some techniques she had learned a few years back working with polymer clay, she made the cutest little Claudio! We had such fun that afternoon, chatting away and eating chocolate coated hazelnuts from the Byron Bay Chocolate Co. Yum! Before we knew it the lesson was over and little sugar Claudio was complete. We set him aside in my drying room until the next phase of her cake. Due to time restrictions, I baked and covered Daria’s cake in fondant ready for decorating. The blank canvas... A plain white fondant covered cake. The next phase was quite laborious and time consuming, so we both got stuck in colouring fondant and cutting strips to decorate the side of the drum. Daria learned the basic principles of working with fondant and decorating cakes. The blank canvas (plain white fondant covered cake) slowly started to look like Claudio’s drum as Daria added more detail. The finished cake was nothing short of a professionally decorated cake, created by a loving mummy for her little boy. Daria got the chance to unleash her creative talents, nurture herself by doing something she loves, AND made something so special and memorable for Claudio. Just magic. The finished cake. Well done Daria! Have you always wanted to learn how to make beauiful cakes or fondant figurines? Or perhaps you have a special occasion coming up and you’d love to make the cake yourself, but you just don’t know where to start, or could use a helping hand. If you are interested in having a lesson at Byron Bay Cake Boutique please send your enquiry through to tara@byronbaycakeboutique.com.au or call 0421 603 482. Stay tuned at https://www.facebook.com/byronbaycakeboutique for updates on structured lessons for groups or individuals. A very proud and happy Daria!